Once you’ve created and named your database, you need to add some barcode values. If you haven’t created a database of values yet, instructions can be found here. There are 2 Options to adding barcodes. Step 2: Click on the database you want to add / edit values. Step 2: Enter a value. This is what the barcode will read. Step 3: [OPTIONAL] Enter a Response. This is what the barcode will return when it is scanned. This option requires a CSV file filled with barcode values and responses. For full guidelines, click Create a CSV file and import it here. Step 3: Click ‘Import’ Button and your barcodes will be loaded within 5 minutes. The Autofill feature allows you to quickly fill a database with custom ID values. Step 1: Click the ‘Databases’ tab on the Navigation Bar near the top of the screen and choose the database you want to fill. Step 2: Click the AutoFill tab. Step 3: Customize your values using the different tools in the Autofill page. Step 4: Click AutoFill database. 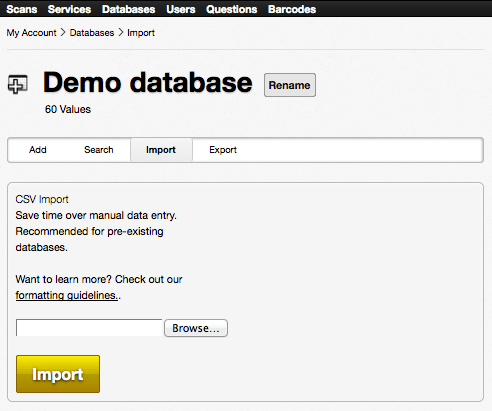 Use your device to add barcode values to your database using a Database Builder service type. The Database Builder service enables the remote creation and editing of asset and ID databases. Step 1: Create a new service using the ‘Database Builder’ service type. Step 2: Sign into the ‘Database Builder’ service on your device and scan the barcodes that you want to add to a database. Step 3: Tap ‘confirm’ under “Confirm add/update this entry”. Step 4: Optional: Enter description text into the response field. Step 5: Change entry status to ‘Valid’. Step 6: Click Next (note: the initial scan will respond with an ‘invalid’ result). Step 7: Re-scan barcode to confirm that its status is now ‘Valid’ within the database.